Late spring is bringing wonderful things to Germany, and that includes strawberries and Spargel, two culinary favorites as the cold of winter is forgotten. 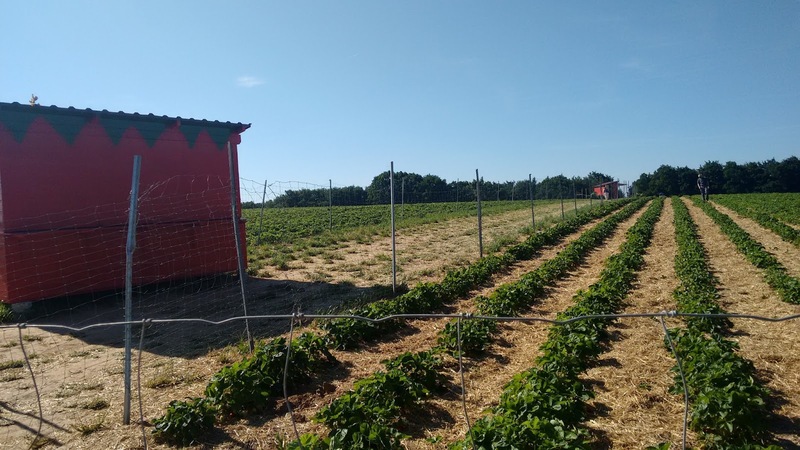 Fans of fresh produce can enjoy a delicious treat by picking their own strawberries. I took advantage of the strawberry fields in Kaiserslautern. 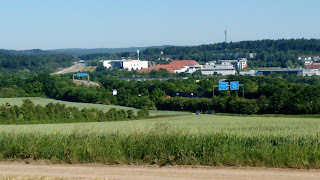 Just through the industrial park on the east side of town, the fields are located above the highway. 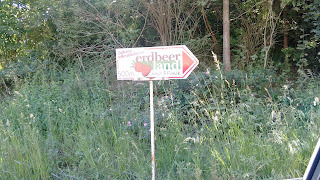 Take Wartenberger Weg and follow the "Erdbeerland" signs, which wind through fields and even takes one under the highway to the cowpath that leads to the red treats. 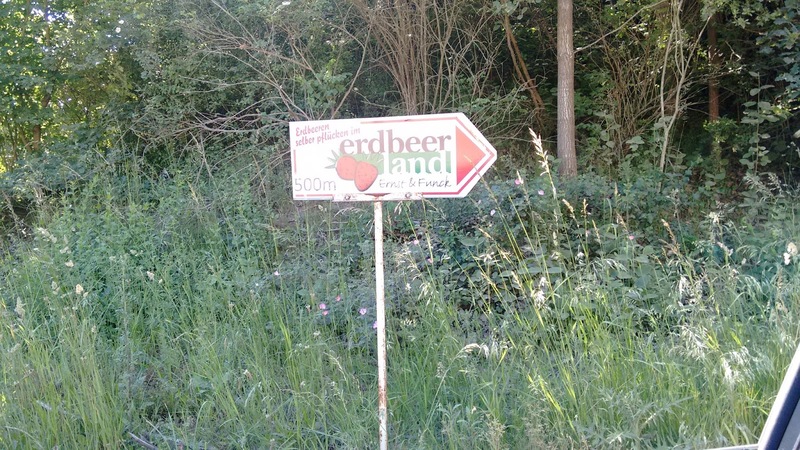 Just follow the Erdbeerland signs! At the top of the hill, there is a clearing for parking and in the middle of the fields is the cashier's hut. 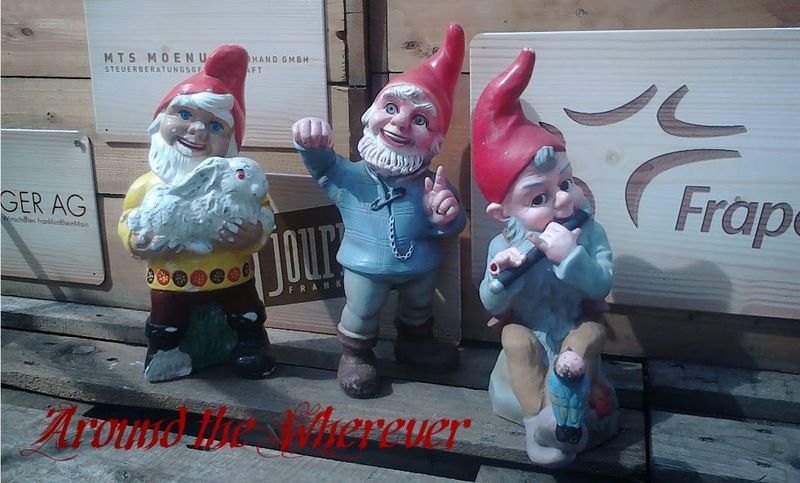 In the hut, one can purchase strawberry wine and already picked strawberries. View from strawberry fields, looking toward the A6 & 63 junction. 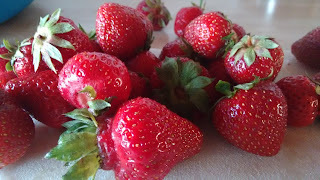 Even better yet, though, is picking one's own strawberries. They're less expensive to purchase. Before picking strawberries, give your container to the cashier to be weighed. The cashier will give a receipt; keep it, because when paying, the customer presents it for the weight of the container to be deducted. From there, the fields, and the delicious strawberries, await! Pick to your heart's content. The fruits (har har) of my labor. This website has more information about the strawberry fields mentioned, as well as additional fields in the region.